1 A None No Power Seat 1 A is a Business Class Bulkhead seat whose close proximity to the lavatory and galley may be bothersome. The tray table is in the armrest, making the armrest immovable and slightly reducing seat width. There is no floor storage for this seat during take-off and landing. 1 C None No Power Seat 1 C is a Business Class Bulkhead seat whose close proximity to the lavatory and galley may be bothersome. The tray table is in the armrest, making the armrest immovable and slightly reducing seat width. There is no floor storage for this seat during take-off and landing. 1 D None No Power Seat 1 D is a Business Class Bulkhead seat whose close proximity to the lavatory and galley may be bothersome. The tray table is in the armrest, making the armrest immovable and slightly reducing seat width. There is no floor storage for this seat during take-off and landing. 1 G None No Power Seat 1 G is a Business Class Bulkhead seat whose close proximity to the lavatory and galley may be bothersome. The tray table is in the armrest, making the armrest immovable and slightly reducing seat width. There is no floor storage for this seat during take-off and landing. 1 H None No Power Seat 1 H is a Business Class Bulkhead seat whose close proximity to the lavatory and galley may be bothersome. The tray table is in the armrest, making the armrest immovable and slightly reducing seat width. There is no floor storage for this seat during take-off and landing. 1 K None No Power Seat 1 K is a Business Class Bulkhead seat whose close proximity to the lavatory and galley may be bothersome. The tray table is in the armrest, making the armrest immovable and slightly reducing seat width. There is no floor storage for this seat during take-off and landing. 11 A None No Power Seat 11 A is a Premium Economy Class Bulkhead seat whose close proximity to the lavatory and galleys may be bothersome. The tray table is in the armrest, making the armrest immovable and slightly reducing seat width. There is no floor storage for this seat. 11 C None No Power Seat 11 C is a Premium Economy Class Bulkhead seat whose close proximity to the lavatory and galleys may be bothersome. The tray table is in the armrest, making the armrest immovable and slightly reducing seat width. There is no floor storage for this seat. 11 D None No Power Seat 11 D is a Premium Economy Class Bulkhead seat whose close proximity to the lavatory and galleys may be bothersome. The tray table is in the armrest, making the armrest immovable and slightly reducing seat width. There is no floor storage for this seat. 11 E None No Power Seat 11 E is a Premium Economy Class Bulkhead seat whose close proximity to the lavatory and galleys may be bothersome. The tray table is in the armrest, making the armrest immovable and slightly reducing seat width. There is no floor storage for this seat. 11 F None No Power Seat 11 F is a Premium Economy Class Bulkhead seat whose close proximity to the lavatory and galleys may be bothersome. The tray table is in the armrest, making the armrest immovable and slightly reducing seat width. There is no floor storage for this seat. 11 G None No Power Seat 11 G is a Premium Economy Class Bulkhead seat whose close proximity to the lavatory and galleys may be bothersome. The tray table is in the armrest, making the armrest immovable and slightly reducing seat width. There is no floor storage for this seat. 11 H None No Power Seat 11 H is a Premium Economy Class Bulkhead seat whose close proximity to the lavatory and galleys may be bothersome. The tray table is in the armrest, making the armrest immovable and slightly reducing seat width. There is no floor storage for this seat. 11 K None No Power Seat 11 K is a Premium Economy Class Bulkhead seat whose close proximity to the lavatory and galleys may be bothersome. The tray table is in the armrest, making the armrest immovable and slightly reducing seat width. There is no floor storage for this seat. 12 F None No Power Seat 12 F is a standard Premium Economy Class seat. 12 G None No Power Seat 12 G is a standard Premium Economy Class seat. 12 K None No Power Seat 12 K is a standard Premium Economy Class seat. 15 G None No Power Seat 15 G is a standard Premium Economy Class seat. 15 H None No Power Seat 15 H is a standard Premium Economy Class seat. 15 K None No Power Seat 15 K is a standard Premium Economy Class seat. 16 A None No Power Seat 16 A is a Premium Economy Class seat in the last row of the section that may have limited recline. 16 C None No Power Seat 16 C is a Premium Economy Class seat in the last row of the section that may have limited recline. 16 D None No Power Seat 16 D is a Premium Economy Class seat in the last row of the section that may have limited recline. 16 E None No Power Seat 16 E is a Premium Economy Class seat in the last row of the section that may have limited recline. 16 F None No Power Seat 16 F is a Premium Economy Class seat in the last row of the section that may have limited recline. 16 G None No Power Seat 16 G is a Premium Economy Class seat in the last row of the section that may have limited recline. 16 H None No Power Seat 16 H is a Premium Economy Class seat in the last row of the section that may have limited recline. 16 K None No Power Seat 16 K is a Premium Economy Class seat in the last row of the section that may have limited recline. 17 A None No Power Seat 17 A is a standard Premium Economy Class Bulkhead seat. Couples often prefer these seats in this row as it is one of the few twosomes in the plane. The tray table is in the armrest, making the armrest immovable and slightly reducing seat width. There is no floor storage for this seat. 17 C None No Power Seat 17 C is a standard Premium Economy Class Bulkhead seat. Couples often prefer these seats in this row as it is one of the few twosomes in the plane. The tray table is in the armrest, making the armrest immovable and slightly reducing seat width. There is no floor storage for this seat. 17 D None No Power Seat 17 D is a Premium Economy Class Bulkhead seat with extra legroom. The tray table is in the armrest, making the armrest immovable and slightly reducing seat width. There is no floor storage for this seat. 17 E None No Power Seat 17 E is a Premium Economy Class Bulkhead seat with extra legroom. The tray table is in the armrest, making the armrest immovable and slightly reducing seat width. There is no floor storage for this seat. 17 F None No Power Seat 17 F is a Premium Economy Class Bulkhead seat with extra legroom. The tray table is in the armrest, making the armrest immovable and slightly reducing seat width. There is no floor storage for this seat. 17 G None No Power Seat 17 G is a Premium Economy Class Bulkhead seat with extra legroom. The tray table is in the armrest, making the armrest immovable and slightly reducing seat width. There is no floor storage for this seat. 17 H None No Power Seat 17 H is a standard Premium Economy Class Bulkhead seat. Couples often prefer these seats in this row as it is one of the few twosomes in the plane. The tray table is in the armrest, making the armrest immovable and slightly reducing seat width. There is no floor storage for this seat. 17 K None No Power Seat 17 K is a standard Premium Economy Class Bulkhead seat. Couples often prefer these seats in this row as it is one of the few twosomes in the plane. The tray table is in the armrest, making the armrest immovable and slightly reducing seat width. There is no floor storage for this seat. 18 C None No Power Seat 18 C is a Premium Economy Class Bulkhead seat with extra legroom. The tray table is in the armrest, making the armrest immovable and slightly reducing seat width. There is no floor storage for this seat. 18 H None No Power Seat 18 H is a Premium Economy Class Bulkhead seat with extra legroom. The tray table is in the armrest, making the armrest immovable and slightly reducing seat width. There is no floor storage for this seat. 20 K None No Power Seat 20 K is a standard Economy Class seat that has a misaligned window. 23 A None No Power Seat 23 A is an Economy Class seat in the last row of the section that may have limited recline. The close proximity to the lavatories may be bothersome. 23 B None No Power Seat 23 B is an Economy Class seat in the last row of the section that may have limited recline. The close proximity to the lavatories may be bothersome. 23 C None No Power Seat 23 C is an Economy Class seat in the last row of the section that may have limited recline. The close proximity to the lavatories may be bothersome. 23 D None No Power Seat 23 D is an Economy Class seat in the last row of the section that may have limited recline. The close proximity to the lavatories may be bothersome. 23 E None No Power Seat 23 E is an Economy Class seat in the last row of the section that may have limited recline. The close proximity to the lavatories may be bothersome. 23 F None No Power Seat 23 F is an Economy Class seat in the last row of the section that may have limited recline. The close proximity to the lavatories may be bothersome. 23 G None No Power Seat 23 G is an Economy Class seat in the last row of the section that may have limited recline. The close proximity to the lavatories may be bothersome. 23 H None No Power Seat 23 H is an Economy Class seat in the last row of the section that may have limited recline. The close proximity to the lavatories may be bothersome. 23 J None No Power Seat 23 J is an Economy Class seat in the last row of the section that may have limited recline. The close proximity to the lavatories may be bothersome. 23 K None No Power Seat 23 K is an Economy Class seat in the last row of the section that may have limited recline. The close proximity to the lavatories may be bothersome. 24 A None No Power Seat 24 A is an Enhanced-Comfort Exit Row seat that has extra legroom and space but is missing a window. You must pay an extra fee to reserve this seat. The tray table is in the armrest, making the armrest immovable and slightly reducing seat width. There is no floor storage for this seat. The close proximity to the lavatories may be bothersome. 24 B None No Power Seat 24 B is an Enhanced-Comfort Exit Row seat that has extra legroom and space. You must pay an extra fee to reserve this seat. The tray table is in the armrest, making the armrest immovable and slightly reducing seat width. There is no floor storage for this seat. The close proximity to the lavatories may be bothersome. 24 C None No Power Seat 24 C is an Enhanced-Comfort Exit Row seat that has extra legroom and space. You must pay an extra fee to reserve this seat. The tray table is in the armrest, making the armrest immovable and slightly reducing seat width. There is no floor storage for this seat. The close proximity to the lavatories may be bothersome. 24 D None No Power Seat 24 D is an Economy Class Exit Row seat.The tray table is in the armrest, making the armrest immovable and slightly reducing seat width. There is no floor storage for this seat. The close proximity to the lavatories may be bothersome. 24 E None No Power Seat 24 E is an Economy Class Exit Row seat.The tray table is in the armrest, making the armrest immovable and slightly reducing seat width. There is no floor storage for this seat. The close proximity to the lavatories may be bothersome. 24 F None No Power Seat 24 F is an Economy Class Exit Row seat.The tray table is in the armrest, making the armrest immovable and slightly reducing seat width. There is no floor storage for this seat. The close proximity to the lavatories may be bothersome. 24 G None No Power Seat 24 G is an Economy Class Exit Row seat.The tray table is in the armrest, making the armrest immovable and slightly reducing seat width. There is no floor storage for this seat. The close proximity to the lavatories may be bothersome. 24 H None No Power Seat 24 H is an Enhanced-Comfort Exit Row seat that has extra legroom and space. You must pay an extra fee to reserve this seat. The tray table is in the armrest, making the armrest immovable and slightly reducing seat width. There is no floor storage for this seat. The close proximity to the lavatories may be bothersome. 24 J None No Power Seat 24 J is an Enhanced-Comfort Exit Row seat that has extra legroom and space. You must pay an extra fee to reserve this seat. The tray table is in the armrest, making the armrest immovable and slightly reducing seat width. There is no floor storage for this seat. The close proximity to the lavatories may be bothersome. 24 K None No Power Seat 24 K is an Enhanced-Comfort Exit Row seat that has extra legroom and space but is missing a window. You must pay an extra fee to reserve this seat. The tray table is in the armrest, making the armrest immovable and slightly reducing seat width. There is no floor storage for this seat. The close proximity to the lavatories may be bothersome. 36 A None No Power Seat 36 A is an Economy Class seat in the last row of the section that may have limited recline. The close proximity to the lavatories and galleys may be bothersome. 36 B None No Power Seat 36 B is an Economy Class seat in the last row of the section that may have limited recline. The close proximity to the lavatories and galleys may be bothersome. 36 C None No Power Seat 36 C is an Economy Class seat in the last row of the section that may have limited recline. The close proximity to the lavatories and galleys may be bothersome. 36 H None No Power Seat 36 H is an Economy Class seat in the last row of the section that may have limited recline. The close proximity to the lavatories and galleys may be bothersome. 36 J None No Power Seat 36 J is an Economy Class seat in the last row of the section that may have limited recline. The close proximity to the lavatories and galleys may be bothersome. 36 K None No Power Seat 36 K is an Economy Class seat in the last row of the section that may have limited recline. The close proximity to the lavatories and galleys may be bothersome. 37 D None No Power Seat 37 D is an Economy Class seat in the last row of the section that may have limited recline. The close proximity to the lavatories and galleys may be bothersome. 37 E None No Power Seat 37 E is an Economy Class seat in the last row of the section that may have limited recline. The close proximity to the lavatories and galleys may be bothersome. 37 F None No Power Seat 37 F is an Economy Class seat in the last row of the section that may have limited recline. The close proximity to the lavatories and galleys may be bothersome. 37 G None No Power Seat 37 G is an Economy Class seat in the last row of the section that may have limited recline. The close proximity to the lavatories and galleys may be bothersome. 38 A None No Power Seat 38 A is an Enhanced-Comfort Exit Row seat that has extra legroom and space. You must pay an extra fee to reserve this seat. The tray table is in the armrest, making the armrest immovable and slightly reducing seat width. There is no floor storage for this seat. The close proximity to the lavatories and galleys may be bothersome. 38 B None No Power Seat 38 B is an Enhanced-Comfort Exit Row seat that has extra legroom and space. You must pay an extra fee to reserve this seat. The tray table is in the armrest, making the armrest immovable and slightly reducing seat width. There is no floor storage for this seat. The close proximity to the lavatories and galleys may be bothersome. 38 C None No Power Seat 38 C is an Enhanced-Comfort Exit Row seat that has extra legroom and space. You must pay an extra fee to reserve this seat. The tray table is in the armrest, making the armrest immovable and slightly reducing seat width. There is no floor storage for this seat. The close proximity to the lavatories and galleys may be bothersome. 38 H None No Power Seat 38 H is an Enhanced-Comfort Exit Row seat that has extra legroom and space. You must pay an extra fee to reserve this seat. The tray table is in the armrest, making the armrest immovable and slightly reducing seat width. There is no floor storage for this seat. The close proximity to the lavatories and galleys may be bothersome. 38 J None No Power Seat 38 J is an Enhanced-Comfort Exit Row seat that has extra legroom and space. You must pay an extra fee to reserve this seat. The tray table is in the armrest, making the armrest immovable and slightly reducing seat width. There is no floor storage for this seat. The close proximity to the lavatories and galleys may be bothersome. 38 K None No Power Seat 38 K is an Enhanced-Comfort Exit Row seat that has extra legroom and space. You must pay an extra fee to reserve this seat. The tray table is in the armrest, making the armrest immovable and slightly reducing seat width. There is no floor storage for this seat. The close proximity to the lavatories and galleys may be bothersome. 39 D None No Power Seat 39 D is an Economy Class Bulkhead seat where the close proximity to the galley may be bothersome. The tray table is in the armrest, making the armrest immovable and slightly reducing seat width. There is no floor storage for this seat. 39 E None No Power Seat 39 E is an Economy Class Bulkhead seat where the close proximity to the galley may be bothersome. The tray table is in the armrest, making the armrest immovable and slightly reducing seat width. There is no floor storage for this seat. 39 F None No Power Seat 39 F is an Economy Class Bulkhead seat where the close proximity to the galley may be bothersome. The tray table is in the armrest, making the armrest immovable and slightly reducing seat width. There is no floor storage for this seat. 39 G None No Power Seat 39 G is an Economy Class Bulkhead seat where the close proximity to the galley may be bothersome. The tray table is in the armrest, making the armrest immovable and slightly reducing seat width. There is no floor storage for this seat. 46 C None No Power Seat 46 C is an Economy Class seat that is often bumped into due to the awkward transition from 3 to 2 seats behind. 46 H None No Power Seat 46 H is an Economy Class seat that is often bumped into due to the awkward transition from 3 to 2 seats behind. 47 A None No Power Seat 47 A is an Economy Class seat that has restricted legroom due to the misalignment with the seats ahead. Couples often prefer to sit in this row as it is one of the only twosomes in the plane. 47 C None No Power Seat 47 C is an Economy Class seat that has restricted legroom due to the misalignment with the seats ahead. Couples often prefer to sit in this row as it is one of the only twosomes in the plane. 47 H None No Power Seat 47 H is an Economy Class seat that has restricted legroom due to the misalignment with the seats ahead. Couples often prefer to sit in this row as it is one of the only twosomes in the plane. 47 K None No Power Seat 47 K is an Economy Class seat that has restricted legroom due to the misalignment with the seats ahead. Couples often prefer to sit in this row as it is one of the only twosomes in the plane. 48 A None No Power Seat 48 A is a standard Economy Class seat. Couples often prefer to sit in this row as it is one of the only twosomes in the plane. 48 C None No Power Seat 48 C is a standard Economy Class seat. Couples often prefer to sit in this row as it is one of the only twosomes in the plane. 48 H None No Power Seat 48 H is a standard Economy Class seat. Couples often prefer to sit in this row as it is one of the only twosomes in the plane. 48 K None No Power Seat 48 K is a standard Economy Class seat. Couples often prefer to sit in this row as it is one of the only twosomes in the plane. 49 A None No Power Seat 49 A is a standard Economy Class seat. Couples often prefer to sit in this row as it is one of the only twosomes in the plane. 49 C None No Power Seat 49 C is a standard Economy Class seat. Couples often prefer to sit in this row as it is one of the only twosomes in the plane. 49 H None No Power Seat 49 H is a standard Economy Class seat. Couples often prefer to sit in this row as it is one of the only twosomes in the plane. 49 K None No Power Seat 49 K is a standard Economy Class seat. Couples often prefer to sit in this row as it is one of the only twosomes in the plane. 5 A None No Power Seat 5 A is a Business Class seat in the last row of the section where the close proximity to the galleys and lavatories may be bothersome. 5 C None No Power Seat 5 C is a Business Class seat in the last row of the section where the close proximity to the galleys and lavatories may be bothersome. 5 D None No Power Seat 5 D is a Business Class seat in the last row of the section where the close proximity to the galleys and lavatories may be bothersome. 5 G None No Power Seat 5 G is a Business Class seat in the last row of the section where the close proximity to the galleys and lavatories may be bothersome. 5 H None No Power Seat 5 H is a Business Class seat in the last row of the section where the close proximity to the galleys and lavatories may be bothersome. 5 K None No Power Seat 5 K is a Business Class seat in the last row of the section where the close proximity to the galleys and lavatories may be bothersome. 50 A None No Power Seat 50 A is an Economy Class seat in the last row of the plane that may have limited recline. Couples often prefer to sit in this row as it is one of the only twosomes in the plane. The close proximity to the lavatories and galley may be bothersome. 50 C None No Power Seat 50 C is an Economy Class seat in the last row of the plane that may have limited recline. Couples often prefer to sit in this row as it is one of the only twosomes in the plane. The close proximity to the lavatories and galley may be bothersome. 50 H None No Power Seat 50 H is an Economy Class seat in the last row of the plane that may have limited recline. Couples often prefer to sit in this row as it is one of the only twosomes in the plane. The close proximity to the lavatories and galley may be bothersome. 50 K None No Power Seat 50 K is an Economy Class seat in the last row of the plane that may have limited recline. Couples often prefer to sit in this row as it is one of the only twosomes in the plane. The close proximity to the lavatories and galley may be bothersome. 51 D None No Power Seat 51 D is an Economy Class seat in the last row of the plane that may have limited recline. The close proximity to the lavatories and galley may be bothersome. 51 E None No Power Seat 51 E is an Economy Class seat in the last row of the plane that may have limited recline. The close proximity to the lavatories and galley may be bothersome. 51 F None No Power Seat 51 F is an Economy Class seat in the last row of the plane that may have limited recline. The close proximity to the lavatories and galley may be bothersome. 51 G None No Power Seat 51 G is an Economy Class seat in the last row of the plane that may have limited recline. The close proximity to the lavatories and galley may be bothersome. All seats feature Thales video screens with multiple channels of music and audio books. All seats feature Thales video screens with 166 foreign and domestic movies and TV programs. All Business seats have access to an AC power port. Power ports are also available between all Comfort Class seats and USB ports are available in Economy. This Boeing 777-300ER features 402 seats in a three-class configuration. Business Class features 30 seats, Comfort Class features 48 seats, and Economy Class features 324 seats. 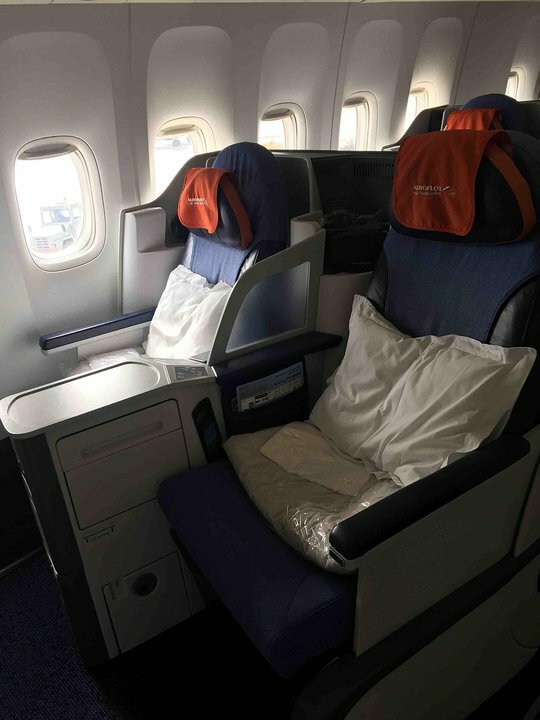 Comfort Class is Aeroflot's Premium Economy product. Space+ seats are also offered in Economy with more legroom and space. Space+ seats may be selected for an additional fee at check-in. Average seat with nothing blocking your legs. Seats ahead of me had water drops coming from the sealing. Average seat but being closer to restrooms make it in the middle of the traffic to and from restroom. On my way to Moscow (SVO) from NY (JFK), this seat had faulty equipment when one one ear was working hence making the usage of entertainment system somewhat unpleasant. On the return flight I was seating one raw behind and noticed the water drops coming from the ceiling directly to seat 24K and 25K (people had to use napkins every 5 minutes). First row - best seats in Aeroflot B777 business class. Room for feet is significantly wider in the lie-flat position because it is located in the wall, not in between the front seats, where it is really narrow. Seats D, G have direct access to the aisle which is a plus. 5th row is not close to the business class lavatory (it is reserved for premium economy and is far enough). Thus, no disturbance to be expected. Rows 2-4 are better because they are further from lavatories and have less noise, however narrower feet room than the first row. Comments about table in the armrest and narrower seat are invalid, all business class seats have the same table and seat width. There is floor storage in all business class rows and storing luggage there is prohibited during take off and landing independent of row number. There is no limitation in recline as the seat has outer shell inside which the seating is moved as needed. This seat is actually better than others because there's nobody all the time kicking the seat shell which still feels (originally my seat was 13G, so I know it very well). Also you can store additional blankets/pillows/clothes on the top of the seat as there is just the wall behind the seat. On the other hand (and it applies to all Comfort seats) the armrests are robust and fixed, so there is no possibility of laying over multiple seats. I was very impressed with Aeroflot's premium economy class. Flew this seat on SU 100/101 JFK-Moscow and return. Food was quite good, service friendly and attentive, and the Caudalie Paris toiletries in the Premium Economy lavatory are a very nice touch. Seat is comfortable with both the legrest out and the recline, but it takes a while to find a good position for sleeping. Was able to get a few hours sleep in on this flight. Would definitely recommend/fly again. I chose seat 18K for my flight from Moscow to Peking and I can not recommend this, nor the seat next to it on 18J. The two seats in front are not aligned to the seats behind, but displaced by ~10 cm. Because of this you have to sit tilted into your neighbor's seat, especially when eating. Also, since you are watching the TV from the side, the screen is a lot darker. I'm a frequent flyer with ~60 flights per year, out of which ~20 are intercontinental. I would not recommend people for a long time. I photographed how my son sat in the seat K26. His height is 1.90 cm. Legs do not have a place. We saved the situation that the next sitting woman went to sit in another place. In general, when boarding a flight, there is a huge bard. Many are trying to change seats. Others even sit in such a way that they alone occupy 4 places and sleep all the flight time. catering was tight. But most of all I liked the ice cream. This seat was about 6 inches from the wall of the plane but i had so much leg room. The seat itself was a bit uncomfortable. The tv screen was ligned up almost perfectly and enough that i had no problems with it. The seat is marked as bad in your standard review, however I found it comfortable, easy to get in and out, recline didn't seem restricted. In general, economy class on Aeroflot, this aircraft seems more generous than other western airlines. I found it competitive with Singapore Airlines. Great flight. Very generous premium economy. Almost like business class on western airlines. Seat got private pwoerplug, USB, plenty of movies and storage. 3 course meal with a choice of 4 main courses. Boeing 777: There is a small gray box (under 30C) that limits space for feet and storage for a carry-on bag/item. The seat is nice, but after 3-4 hours it started to feel cramped. The "recline" is not really a recline, the seat just slides down and forward just alittle bit. Very small and almost unnoticable difference after seat is "reclined". For a 12 hour flight, the seat is bad. Very hard to sleep and the close proximity to the bathroom is bothersome. You can hear every flight. I flew with aeroflot many times already and always had a great flight. 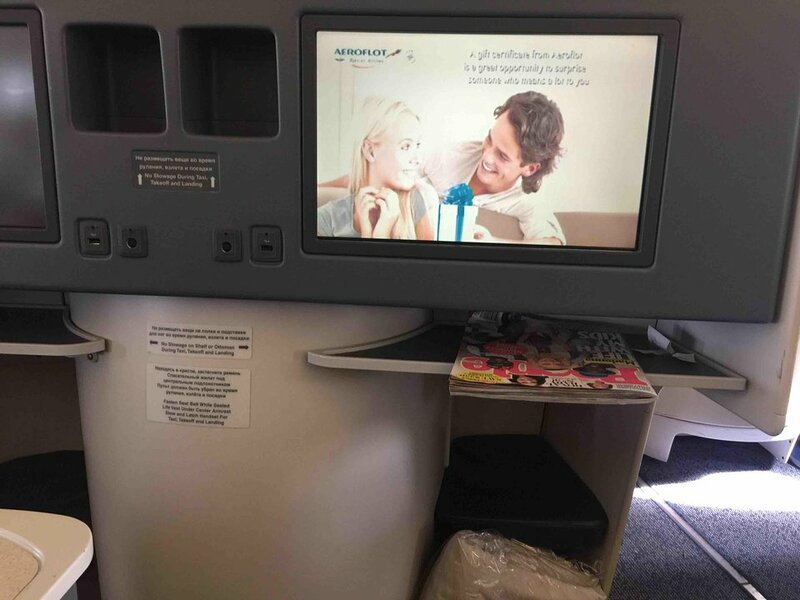 I flew in Business class is before (which is great), but recently I discovered premium economy class and never going back to business or economy haha It is amazing how comfortable it is for such a small price. Premium economy has bigger seats and more legroom than economy. Meals are exactly the same as offered in business class, drinks served in glass. The staff was friendly. Wireless internet was available on board. Overall great experience with Aeroflot. The seats are comfortable and service is excellent. Food and beverage served were above average and served by very attractive staff to boot. My only complaint is cabin temperature set too high. It is down right uncomfortable. 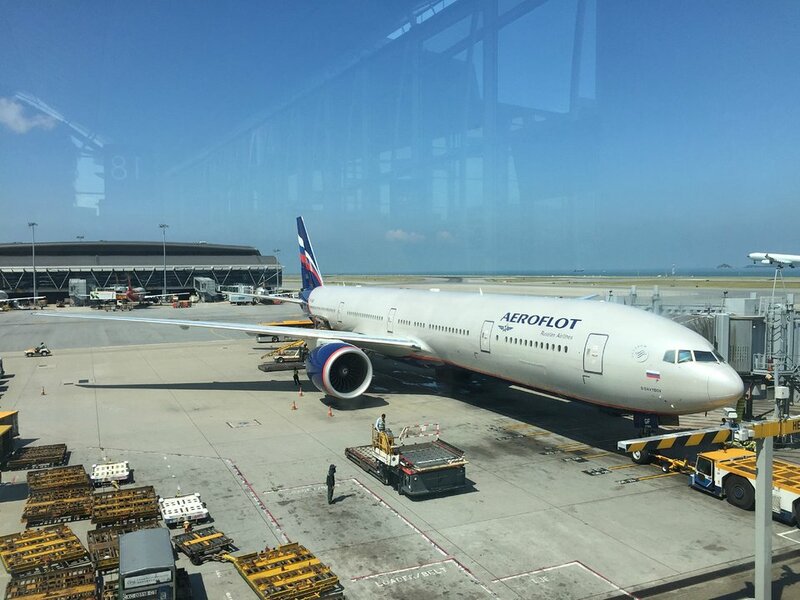 Took Aeroflot business from HKG to SVO on their new 777. Very nice business, with attentive and personal service. The cabin was completely full, yet the crew was top-notch. 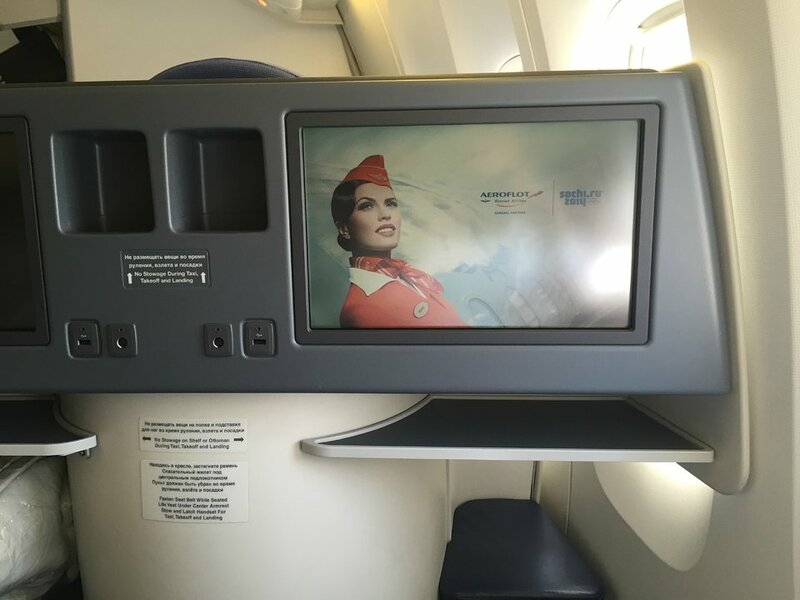 Good choice of IFE with a little remote in your seat to operate the system. Seats turn into full-flat beds for a good rest. Food was good, though not outstanding, although there is a choice of three main courses. The only negative point is that there is only one toilet in business class. That becomes a bit of an issue if everybody wants to use it just before the landing. There should be at least two dedicated toilets for 20 passengers. Was on a round trip HKG-ZHR-HKG in business and enjoyed every minute on the plane. Very attentive and personal service in totally full as well as half empty cabins. Nice choice of food, and very comfy seats that turn into fully flat beds. Access to window seats is quite easy, even if the aisle seat is occupied. The IFE has big screens and a little remote with its own screen to operate it easily. Only drawback is, that they only turn it on after take off and shut it down before landing. Will definitely fly again. It's a premium economy class, branded 'Comfort Class'. Seats are "shells", i.e. they do not recline in general understanding, instead they "push" forward and some recline is "remulated" by the fact that back is now behind you. Small of the back is still held by the seat even when it's "reclined", so you don't need extra pillow between your back and the seat. There is a lot of space for legs, except for the left leg - seat mounts for row 13 make it hard to comfortable stretch left leg parallel with right. You still can turn a little and stretch perfectly, even if you're 180 cm tall, like me. Overall, it's much more comfortable for me than standard economy class - I don't feel crunched at all, but more recline (like in business class :) would be good. Nevertheless, I enjoyed my 12-hour flight and took a good sleep - no crunching, back is supported, plenty of space. Seats looks very alike Air France's premium economy, but I have not tried these and cannot compare. Double-sized table is great: you don't have to worry about food flipping over. Food is served with metal flatware and non-plastic dishes and is good, especially for in-flight food. You have a power socker under the chair and Wi-Fi is offered by OneAir. Charges are $10 per 10 MB, afterwards you can either re-purchase it or continue without interruption for higher rate of $1.5/MB. Internet was unavailable for several hours in the beginning of the flight, when the plane flew near North Pole and Greenland. I haven't tested speed because of trafic limitations, but it's ok for chatting. Originally booked premium economy (called "comfort") but on the way to Seoul and back upgraded to biz using aeroflot miles at check in. Very nice option! Very attentive service onboard, food served twice: after take off and 2h before landing. Aeroflot provides good selection of main courses, overall food is tasty. Wine list offers you selection of wines and other alcohol drinks. Seat is comfortable and you easily can sleep after transformation to a flat bed. I managed to sleep approx 3,5-4h on each flight leg. In the morning they do not offer champagne, but if you really want, just ask and they bring it to you. Very good experience. I always enjoy flying with Aeroflot 777-300ER. The business class pods seem quite new. The only benefit of the first row is the extra storage space below the foot rest. I flew Aeroflot 102 and 103. On the trip to SVO from JFK I sat in Row 24 window seat. The problem is there was no window...it's a closed panel close to the emergency exit. Plenty of room, but if you want to look out the window, avoid this seat. On the return flight, I chose 23A...I'm 6'1" and had enough room. If you choose a window seat, there's enough space between the wall and the seat in front of you to place one leg. I don't put anything under the seat, so my other leg was under the seat in front of me, allowing me to stretch when needed on the 10.5 hour flight. This seat has less leg room than average seats on this plane, comparing to 45K. My knees were constantly bumped by a passanger moving in the seat in front of me. Also, the seats gets progressively further from the windows at the back of the plane. This means there is some extra space to put things or legs, but it's not possible to lean against the window when sleeping. No limited recline in row 14. Decent premium economy product with good service. Seat coerces travelers into one single seating position... Not at all conducive to sleeping. Next time I'll book standard economy again. The seats are almost no-frills. This is not necessarily negative. They are a bit on the thin side but that provides plenty of legroom and space above. This is the airline of choice between Asia and Europe for non-direct flights. Overall best economy class food compared to every other airline, generous wine pours, best economy class pillows (better than some other airlines biz class). I was traveling from SVO to BKK with my girlfriend and took 18K and J economy seats. The economy seats on this aircraft are very uncomfortable! When you recline the seat, the bottom moves to the front (reducing your knee-space) and making the seating position uncomfortable. The Aeroflot Airbus A320 economy seats felt like business class after a 10 hours flight on this plane. 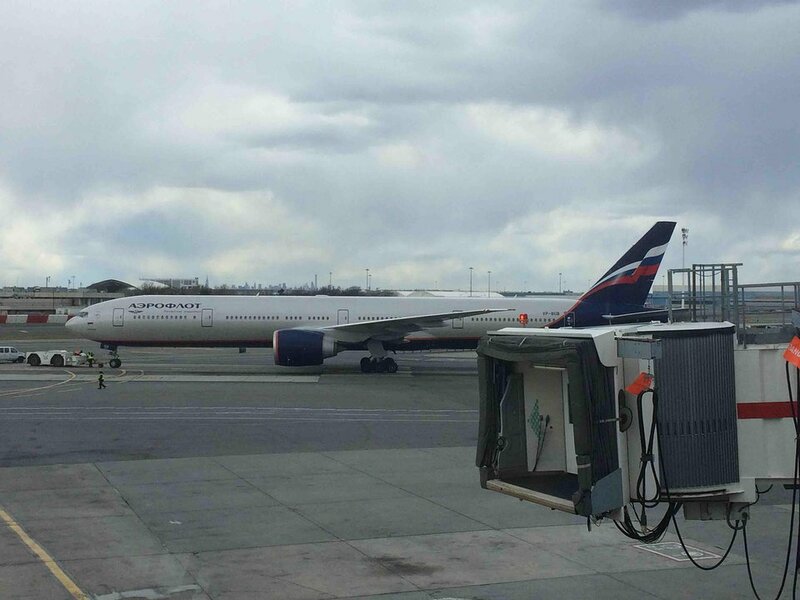 Aeroflot flies 1 versions of Boeing 777-300ER.